Sarah de Leeuw, Where It Hurts (Edmonton: NeWest, 2017). Paperbound, 123 pp., $19.95. In her essay collection, Where It Hurts, Sarah de Leeuw has no illusions about how the Northern B.C. city of Prince George, her home for half the year, is perceived. “This is a city that guidebooks warn tourists and travellers away from,” de Leeuw writes. “Prince George… is not a place to linger.” So, obviously, she lingers. Though not out of any cheerleading, chamber-of-commerce obligation, but rather a writerly instinct to attend to those things that so often go unattended. In “Columbus Burning,” the essay quoted above, there’s the small, telling moment when de Leeuw’s eye is caught by a sign outside a local bar. “Live Girls and Home Cooked Meals,” the sign reads, which she reports without judgment. It speaks for itself in any case. There you go, de Leeuw seems to be saying, the squalid and the welcoming all wrapped up together. Here, as in most of the eleven essays in this book, de Leeuw’s preoccupation with overlooked places is only exceeded by her concern for the women and men who live undervalued lives in those places, who are out of sight and off the map. Like the anonymous man who dies in a hotel fire in “Columbus Burning.” He is someone for whom neither guidebooks nor history books are written. Instead, there’s this essay. And this book. 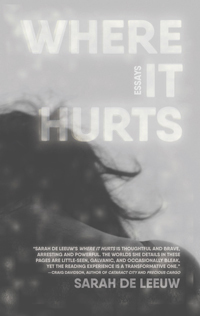 In Where It Hurts, de Leeuw skillfully reconciles her background as an academic—she’s an associate professor at the University of Northern British Columbia and a researcher into the issues that affect marginalized communities—and a poet. What she chooses to say is intimately tied and ultimately revealed by the way she chooses to say it. In the passage above, for example, a long single sentence unfurls into a heartbreaking tribute to the simple, fervent, sometimes insupportable hope that a young girl should grow up free from interference and harm. Most of de Leeuw’s essays proceed elliptically, offering up fragments of information and flashes of emotion. Narrative connections tend to be left to the reader and there are times when this reader couldn’t help wishing there was more that was personal and, for that matter, more that was story in these deeply personal stories. Admittedly, this is a quibble. In the title essay, for instance, de Leeuw highlights the power of empathy at the same time as she acknowledges its limitations. The lyrical evocation of all this pain—whether from a faltering relationship or witnessing inexplicable acts of physical cruelty—is cumulative and devastating. There are lighter moments in Where It Hurts; the best ones focus on de Leeuw’s recurring efforts to come up with a counter-narrative to those guidebooks disparaging Prince George. “Quick-Quick. Slow. Slow.” practically choreographs the trick to surviving and celebrating a city with a boom-and-bust economy, unbearably harsh winters, disappearing resources. What is the trick? You keep dancing, de Leeuw points out, literally and figuratively. “This is a back-and-forth town,” she writes. In “After Paul Auster Spoke about Lightning,” de Leeuw even indulges in some cheerleading on behalf of Prince George’s cultural scene, boasting about the town’s three-day film festival of edgy documentaries. Though, to be fair, she seems much more pleased and preoccupied with the mystery surrounding “the bank of urinals in the women’s washroom” at the local movie theatre. It’s one more thing, in other words, for de Leeuw to linger on in Where It Hurts. Another chance for her to put the people, places, and stories she cares so much about on the map.